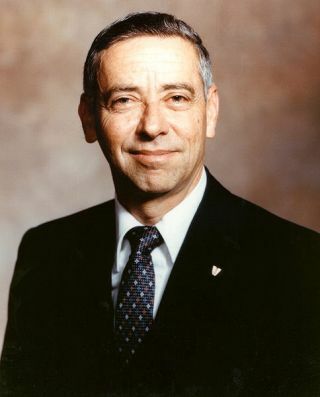 Aaron Cohen, former director of NASA's Kennedy Space Center. WASHINGTON ? Spaceflight pioneerAaron Cohen, who was at the helm of NASA?s Johnson Space Center during theChallenger shuttle tragedy and the agency?s subsequent return to flight, died Fridayafter a lengthy illness. He was 79. Cohen, who spent 33years with NASA, was serving as acting deputy administrator in 1993 when heleft the agency to accept an appointment as a professor at his alma mater,Texas A&M University in Bryan, Texas. ?Aaron Cohen was one of my earlymentors here in NASA and he was instrumental in the success of numerous pivotalachievements in human space flight,? NASA Administrator Charles Bolden said ina Feb. 25 statement. ?His engineering expertise and rigor were tremendousassets to our nation and NASA. Aaron provided the critical and calm guidanceneeded at the Johnson Space Center to successfully recover from the Challengeraccident and return the space shuttle to flight. We will miss him as acolleague, mentor, and a friend. Our hearts go out to his wife, Ruth, and therest of his family.? Cohen joined NASA in 1962 andserved in key leadership roles during the agency?s Apollo lunar program. From1969 to 1972 he managed the Apollo Command and Service Module efforts. Hesubsequently oversaw the design, development, production and test flights ofthe agency?s space shuttle fleet as manager of NASA?s SpaceShuttle Orbiter Project Office from 1972 to 1982. After serving as directorof engineering at Johnson for several years, he was named center director in1986, serving in that post until 1993. Cohen twice earned thePresidential Rank of Distinguished Executive ? in 1982 and 1988 ? the highestaward given to federal executives. He was also a three-time recipient of NASA?sDistinguished Service Medal. Cohen was a member of the National Academy ofEngineering and a fellow of the American Astronautical Society and the AmericanInstitute of Aeronautics and Astronautics here. He was a distinguished alumnus ofTexas A&M, from which he earned a bachelor?s in mechanical engineering in1952. He earned a master?s in applied mathematics from Stevens Institute ofTechnology, Hoboken, N.J., in 1958. He also was a recipient of honorarydoctorates from Stevens Institute and from the University of Houston-ClearLake.